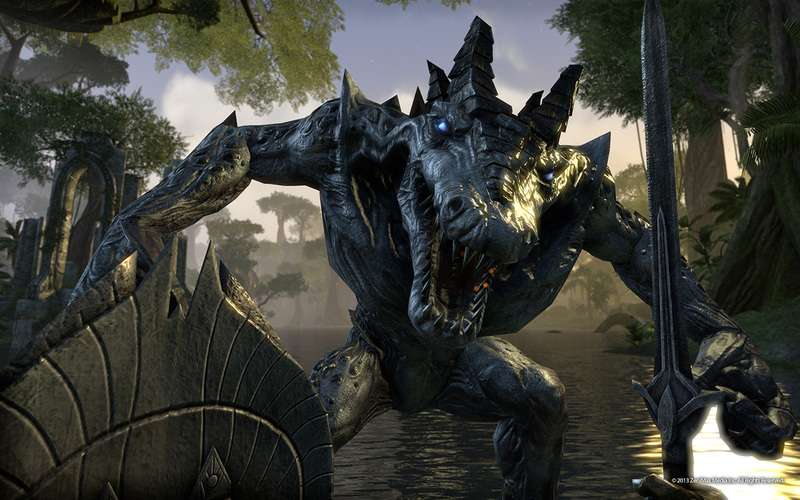 Bring some of those Dragonborn muscles into the real world. For anyone about to take their first steps into Skyrim VR hoping for an authentic, immersive experience into a fantasy world plagued by dragons, the best thing you can do is dive right into the role-playing aspects of the game. That means clearing some space in your living room and treating every gaming session like you’re fighting for your life — because if you follow these suggestions, you will be. There’s a reason why the Dragonborn is so ripped in every promotional video and commercial you’ve seen about Skyrim, and you’re about to learn why. The best way to play Skyrim VR is through the full Skyrim Bundle, because it includes everything you’ll need: the game, the PlayStation Eye, the PlayStation Move Controllers, and, of course, the VR headset. Clear out all the furniture in the space in front of your TV. As tempting as it might be to sit down as you travel the lands of Tamriel with a traditional controller in your lap, don’t. After all, sitting is the new smoking. "Crouching" allows you to "Sneak" and do bonus damage with attacks in 'Skyrim'. Sneaking around in any Elder Scrolls game is a great way to play since you get a damage bonus when you Sneak Attack an enemy. In-game, your character physically crouches down, often hiding in the shadows to then quietly sneak up on unsuspecting enemies. In Skyrim VR, Sneak is unfortunately activated with a button press, but if you want to really get into it, you should just actually crouch in real life every time you hit the Sneak. This is a role-playing game after all, right? The same goes for actually moving around. You have a few different options for movement, depending on whether you play with the traditional DualShock controller or the PlayStation Move controllers, but either way you can try to step with your character as they move about the world. Just be sure to march in place rather than walking directly into your TV. If you’ve got a treadmill at home, you could set it up in front of your TV like this guy did. You need those Move controllers. The default setting for Skyrim VR has you use a traditional controller. That might be more accessible and comfortable, but it has some serious limitations when it comes to making you feel like you’re actually swinging a sword at a dragon’s hide. You probably got some sort of PSVR bundle that comes with the two PlayStation Move controllers. This being a first-person game that involves on doing things with two hands, Skyrim VR is a perfect fit for PSVR and those Motion Controllers. Each controller effectively becomes your hand in-game. Want to use those hands to fire a bow? Smite enemies with fireballs? Swing a greatsword? Hold a sword and shield? Do all of those things with Motion Controllers. Get weighted gloves more like this rather than traditional boxing gloves. One of the most distracting things that takes away from Skyrim VR’s immersion is the sense that everything you do is weightless. The Move Controllers are great for a lot of things, but they don’t translate well to the heft of whatever weapons you might wield in-game. Even the largest of weapons have zero heft to them, which takes away from the immersiveness of the experience. If you’re looking for an authentic experience, your only real choice is to go full Mage and blast off some weightless fireballs. Or, you can get some weighted gloves. Sony, Bethesda, and every practical, safety-minded individual out there would argue against this, but an immersive fantasy role-playing experience like this requires that you take it seriously, right? Regardless of your character’s eventual build, with some kind of weighted glove you can feel the heft of your sword sword or the light strain on your bow string. Amazon has tons of great options. Just be sure to look for ones that put most or all of the weight on the top of your hand. Thicker gloves might obstruct your ability to hold the Move controllers effectively. One of the almost irritating things about combat in Skyrim VR is how weapons, especially one-handed weapons, sort of just become disembodied objects floating in space. You can wiggle your wrist around and still do damage against animated skeletons. Try to avoid doing this and instead opt for some of the following authentic experiences. Keep in mind that depending on your chosen playstyle(s), you’ll want to consider investing in specific in-game Skill Trees that grant you various boosts as you level up. 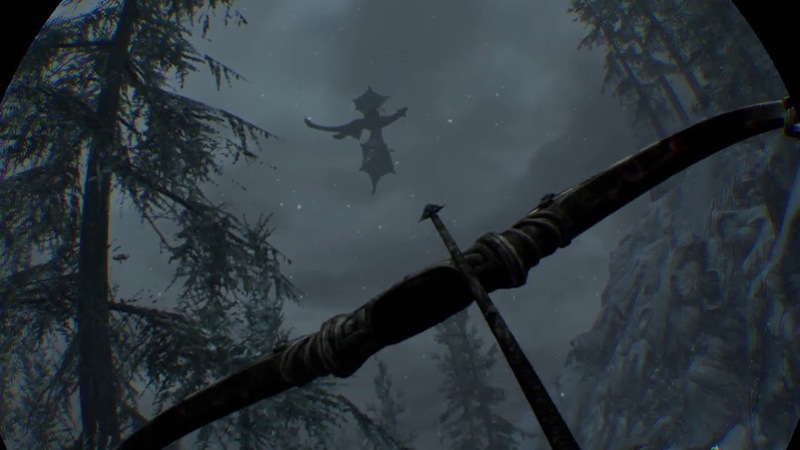 Few moments inspire fear in VR quite like random dragon attacks in 'Skyrim VR'. VR adds an extra layer of depth added to the game. While aiming, you can use your depth perception to aim your shots. What’s more, you’ll have to use each of your real-life hands to hold the bow and pull back the drawstring. So you get a bit of an upper body workout as well (especially with the aforementioned weighted gloves). Sneaking around also benefits an Archer quite a bit. Necessary skill trees include Archery, Sneak, Light Armor, and maybe some Illusion magic to help stay hidden. Wielding two one-handed weapons is a great way to go in Skyrim VR, especially if you commit to wide, sweeping sword slashes. Otherwise, it’s easy to just aim your weapons forwards and flick your wrists until you emerge victorious in every fight. Redguards and Orcs get bonuses for One-Handed weapon usage, but just about every race can function in this kind of playstyle. Pile most Skill points into One-Handed, whichever armor type you prefer, and maybe even Smithing or Enchanting so you can produce the best gear possible. You can focus on lighter builds that utilize Sneak, or heavier ones that just run in and smash things. 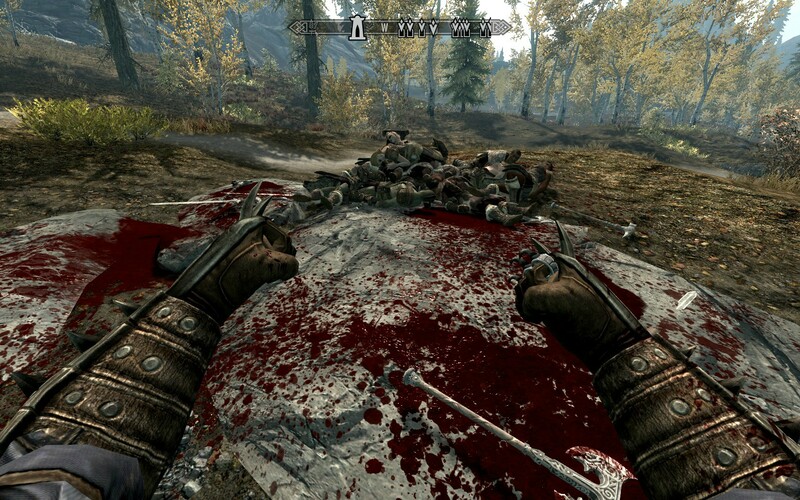 A sword and shield combo is one of the most satisfying loadouts in 'Skyrim VR'. The best way to do this one is to hold some kind of really heavy object in your left hand and keep your left Motion Controller hoisted up, as if you were really wielding a shield. Maybe just pick up your cat while you play and use him/her to block incoming blows from enemies. That or some other hefty object. Doing so will make shield-bashing that much more exciting. Most races in the game work for a traditional warrior-type playstyle, with slight preference given to Orc, Nord, or Redguard. For skills, focus on training One-Handed, Block, and probably Heavy Armor. This could be you in no time at all. You might not have seen this one coming, but a fairly decent build for Skyrim in general is a kind of monk class that literally just punches things to death. You can augment this with supplemental abilities like Alteration to boost defense or focus on Sneak and/or Healing magic, but the bread and butter will be punching. If this is the option you go with, Kahjiit is by far the best race to choose, with Argonian a close second (though the benefits aren’t as great). Both races get a natural boost to “Unarmed” damage. Furthermore, in the Heavy Armor skill tree, one particular ability called “Fists of Steel” allows you to do your gauntlet’s armor rating in damage. So if you run a Khajiit with Heavy Armor gauntlets, you’re looking at a heavy damage boost from the beginning of the game. “Unarmed” attacks also benefit from various One-Handed skills, so consider devoting time and energy into that tree. This option transforms every single dungeon into its own kickboxing class for players — especially if you opt for the aforementioned weighted gloves. Throw in some kicks for good measure, and you’ll be a fit AF Dragonborn in no time at all.